Of Civil Wrongs and Rights: The Fred Korematsu Story a documentary film directed by Eric Paul Fournier won Emmys for 'Outstanding Individual Achievement in a Craft (Direction)' and 'Outstanding Individual Achievement in a Craft (Editing)' at the 23rd Annual News and Documentary Emmy Awards. "In the autumn of his life, Fred Korematsu has finally found vindication for the battles of his youth. As a young man of 23, Korematsu defied the 1942 presidential order that forced the evacuation of Americans of Japanese descent from cities and towns on the West Coast into inland interment camps across the West. He was convicted and sent to jail. But now, for that same act of defiance, the 79-year-old Korematsu is being hailed as a hero worthy of the nation's highest civilian decoration. In an ironic twist, while one U.S. president was instrumental in his conviction, another is now responsible for his canonization; a testament to the long road this country has traveled over the past half-century in the civil-rights arena. Last week, President Clinton named Korematsu one of the 15 winners of this year's Presidential Medal of Freedom award, the nation's highest civilian honor. The awards ceremony is expected to be held today at the White House." " 'I'm overwhelmed,' Korematsu said from his home in San Leandro, Calif. 'It's really an honor for me. I'm accepting this award for all Japanese Americans taken to the camps, for all their suffering and embarrassment.' A self-employed draftsman, Korematsu is happy to see that the country has acknowledged the wrong done to Japanese Americans in his lifetime. 'This is a reminder for all of us that prejudice will always be with us,' he said. 'We should be vigilant to make sure this will never happen again.' The award brings to a close Korematsu's 56-year struggle to clear his name. He took his case to the U.S. Supreme Court and lost. For 40 years, he lived his life as a convicted criminal." "Then in Nov. 1984, the Supreme Court overturned his conviction, and ruled that the internment program violated the constitutional rights of Japanese Americans. The decision led to the landmark 1988 Civil Liberties Act in which the U.S. government apologized for the forced internment and compensated each internee with a $20,000 payment. 'This is an ordinary man who did an extraordinary act.' said Dale Minami, a San Francisco lawyer and a member of the team that succeeded in challenging Korematsu's conviction. 'This shows that everyday people can rise and become heroes. What he did was not an act of intellectual defiance.' He said, 'this is wrong and I don't have to go.' ' Korematsu did not intend to be a hero, according to Minami. 'His motive was self-preservation. Later, it became an act of moral defiance,' he noted." "Korematsu was born in Oakland in 1919, the third of four sons of Japanese immigrants. The family owned a flower nursery. Although Japanese was spoken at home, he was more at ease with the English language. He remembers observing Japanese festivals, but he spent much of his time playing basketball, tennis, and football with his classmates. He considered himself a typical American boy. But his life changed dramatically - as that of all Japanese Americans - when Japan bombed Pearl Harbor on Dec. 7, 1941, and the United States was dragged into World War II. Wary of spies and saboteurs, the U.S. government cracked down on Japanese Americans on the West Coast with a curfew and interrogation by the F.B.I. On Feb. 19, 1942, President Roosevelt issued Executive Order 9066, mandating the internment of all Japanese Americans." "Korematsu's family was taken to Tanforan, a former race track south of San Francisco for processing, but he decided not to go. Engaged to an Italian American at the time, he tried to change his appearance by having his eyelids surgically altered. He lived in a boarding house, worked at several jobs, and made plans to join his fiancee on the East Coast. But on May 30, 1942, he was arrested and joined his family at Tanforan. They were later taken to the Topaz internment camp in Utah. 'They forced us into concentration camps without trial or hearing,' Korematsu said. 'We felt we were Americans, and we want to help [in the war effort] too. We were not the enemy.' Wayne Collins, an attorney with the Northern California American Civil Liberties Union, convinced Korematsu to take his case to court. He eventually lost, however, and Korematsu was sentenced to five years probation." "On Feb. 19, 1943, Korematsu and two other resisters - Miyoru Yasui and Gordon Hirabayashi - appealed their case to the Ninth Circuit Court of Appeals and later to the U.S. Supreme Court. But in Dec. 1944, the high court ruled that Korematsu 'was not excluded from the military area because of hostility to him or his race,' but rather because 'we're at war with Japan.' Korematsu headed for Detroit after leaving the camp. In 1949, after he married, he and his wife, Kathryn, moved to the Bay Area where they raised their two children, Karen and Kenneth, both now in their 40s." "His conviction was always in the back of his mind. 'I was waiting for someone to help me,' Korematsu said. 'To re-open the case would cost a lot of money.' That help came unexpectedly in 1981 when a historian and law professor, Peter Irons, found in his research that government prosecutors possessed evidence in Korematsu's trial indicating that Japanese Americans were generally loyal to the United States. This evidence was not disclosed by the prosecution. 'I was shocked,' said Irons, now a political finance professor at the University of California at San Diego. 'Lawyers are not supposed to lie to the court, and this was the solicitor general of the United States, the highest lawyer in the government.' He found that the government lied to the Supreme Court in 1944, deliberately withholding critical evidence, such as military intelligence, that concluded that Japanese Americans did not pose a serious threat to U.S. security." " 'The injustice was so obvious that the government has to acknowledge it,' said Irons, who found the evidence while researching his book Justice at War, which deals with the Japanese American internment. 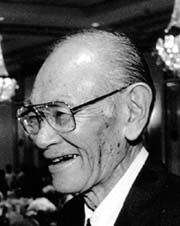 Irons contacted Korematsu and other defendants about re-opening the case based on the new evidence. He then assembled a team of lawyers - mostly Asian American - led by Minami. On Jan. 19, 1983, the attorneys filed a writ of coram nobis - the legal term for error committed before the court - in San Francisco federal court. They argued that the government committed fraud in prosecuting Korematsu in 1942 because there was no military necessity to place Japanese Americans in internment camps. After well-attended hearings, Judge Marilyn Hall Patel overturned Korematsu's conviction on Nov. 10, 1983, more than 40 years after his arrest. The government did not appeal the decision." " 'In a way, it's a vindication of his position,' Irons said of Korematsu receiving the Medal of Freedom. 'President Roosevelt did not have any hesitation in ordering Japanese Americans to the camps. But President Clinton has decided to honor Fred's courage.' Korematsu feels it was important that the injustice against his people was acknowledged and remedied 'because they can do this again to any Asian or any American for that matter. How safe are we?' Rep. Robert Matsui, D-Calif., said that Korematsu animated a national conscience to redress an injustice perpetrated by the government against its own citizens. 'Every American today and in the future owes Fred a debt of gratitude for his efforts to guarantee that no citizen, regardless of their ancestry, can be denied due process and the basic liberties guaranteed by our constitution,' Matsui said in a press statement." "To ensure that Americans do not forget the lessons from the internment, Korematsu, a shy, private person, has spoken before students and educators at Harvard, Princeton, Yale, and other prestigious schools about his case. 'Without those educational efforts, we could not have come to this point when a Japanese American is being honored by the very government official who sent his people to the camps,' Minami said. 'It's just beautiful. There is a symmetry to this whole episode of his life. He stood up in 1942 to challenge the [presidential] order and came back 40 years later to overturn his conviction. Now, he stands at the White House and [is] honored for his convictions.' He said Korematsu's case and those of the other resisters exposed the weaknesses of the judicial system, but led to better awareness of civil rights." " 'The great civil-rights movement sensitized this country to the issue of racial discrimination,' Minami said. 'It helped people understand how wrong slavery was, and the mass incarceration of a whole racial group could be.' In an effort to preserve Korematsu's civil-rights legacy, the Asian Law Caucus, a San Francisco-based nonprofit, established the Fred Korematsu Civil Rights Fund, which provides a financial base for the agency's human- and civil-rights work. The fund pays for annual fellowships at the Asian Law Caucus for recent law graduates, as well as educational conferences on civil-rights issues. This year, the fund will play a growing role in student internships, scholarships, and professional training, according to Asian Law Caucus Executive Director Angelo Ancheta." " 'The Korematsu case serves as a reminder that we should be very careful and vigilant of our civil liberties,' Ancheta said. 'In many ways, [the award] is a symbolic honor, a recognition of the wrongs committed during World War II. It is also a recognition of one individual's courage, as well as support from various communities to have the conviction overturned.' Korematsu energized the Asian Pacific American civil-rights advocates, 'sending a message that you can get something done, even if it looks almost impossible to achieve,' according to Ancheta. Still active, Korematsu now works mostly at home. Right now, he is involved in the renovation of a hotel in San Mateo. This week, he and his wife leave for Washington, D.C., to receive the award, which will be presented at the White House on Thursday." "The Korematsu's eldest son, Kenneth, is single. Their daughter, Karen, is married to an Englishman, Donald Haigh, and has no children. The incarceration of his family was a painful experience for Korematsu, and the topic was never brought up during family discussion. Karen chanced upon the fact that her father played a prominent role in the effort to strike down the presidential order when she learned about a case called Korematsu v. United States while doing research on the Japanese American internment. After her father's court victory in 1983, Karen was instrumental in establishing the Fred Korematsu Civil Rights Fund." "The Korematsus are flying to Washington, D.C., courtesy of the Civil Liberties Fund, which was created following the success of the redress movement to help educate the American people about the wartime internment. Joining the couple are Minami, Irons, and other A.P.A. leaders in the nation's capital. Among the winners of the Presidential Medal of Freedom are civil-rights leader Arnold Aronson, who joined Martin Luther King in the historic March on Washington in 1963, and Wilma Mankiller, who became the first woman to lead an Indian tribe when she was elected chief of the Cherokee Nation of Oklahoma in 1987. Also being honored are philanthropists David Rockefeller and Brooke Astor, Pulitzer-Prize-winning author Robert Coles and Mario G. Obledo, co-founder of the Mexican American Legal Defense and Education Fund."